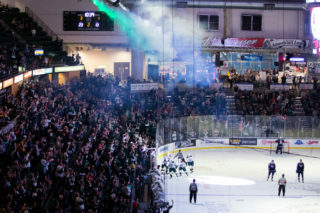 EVERETT, Wash. – A Connor Dewar goal 53 seconds into the first overtime period after overcoming a pair of two goal deficits helped lift the Everett Silvertips over the Spokane Chiefs in incredible fashion, 5-4 for the victory, in overtime before 4,051 fans at A.O.T.W. Arena on Friday night in U.S. Division action. 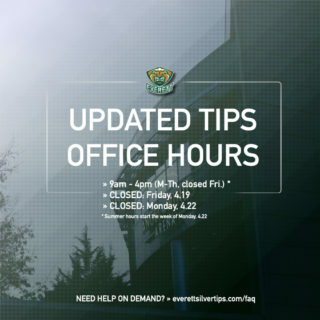 The Silvertips were able to score three third period goals to send the game to overtime, while their counterpart scored all their goals on the man-advantage. Down 3-1 in the third period, the Tips ripped off three unanswered goals by Wyatte Wylie, Akash Bains and Martin Fasko-Rudas, before Ethan McIndoe’s deflection with 15 seconds left completed an insane flurry of offense in the final minutes of regulation. UP NEXT: The Western Conference-leading Silvertips play at home again tomorrow, Dec. 1, against the Kootenay Ice at 7:05 p.m. (1380 AM / 95.3 FM / Tips App / WHL Live). 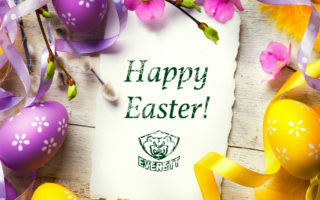 Tickets remain on sale at www.everettsilveritps.com/tickets. Spokane opened the game up with two power play goals. At 2:41, Chiefs center Eli Zummack scored the game’s first off assists from winger Riley Woods and winger Ethan McIndoe. Everett forward Riley Sutter took an early boarding penalty at 1:36, which set up the eventual goal. The Chiefs second power play goal came at 10:03, after a Reece Vitelli interference call at 9:12. Newly acquired center Luc Smith put the Chiefs up 2-0 off assisted from Woods and defenseman Ty Smith. Each team put up nine shots on goal in the opening frame. Just 24 seconds into the second period, Spokane’s Ty Smith was called for interference in his defensive zone near the Everett bench. The Silvertips took advantage and cut the Chiefs lead to 2-1, after a Sutter power play. The Silvertips cut the Chiefs lead to 2-1, with a Sutter power play goal at 1:48 into the second. Everett forward Bryce Kindopp was posted in front of the net, created a rebound with a close shot, where Sutter swooped the loose puck for a fore hand shot. Everett recorded 16 shots in the second, while Everett goaltender Dustin Wolf turned away 9 shots on net. Everett forward Sean Richards began the third period with a cross checking penalty at 3:32, which set up the Chiefs third power play goal of the night. Defenseman Filip Kral netted a shot from the point unassisted at 4:38. 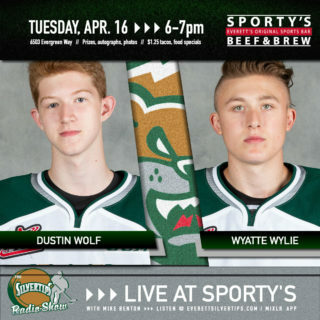 The Silvertips retaliated with a goal scored at 10:32 by Wylie, assisted by Kindopp and Dewar. Kindopp carried the puck around the net and dished it to an open Wylie near far circle, who wristed a goal glove-side of Chiefs goaltender Dawson Weatherill. Everett forward Akash Bains tied the game, 3-3, at 13:26, as Bains was posted in front of the net and accepted a centering pass from defenseman Gianni Fairbrother, to set up one-time blast. Luke Ormsby also recorded an assist on the play. 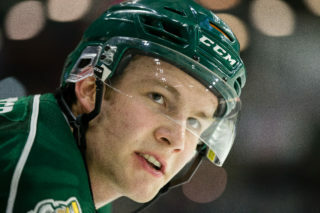 Silvertips import forward Martin Fasko-Rudas put the Silvertips a 4-3, with an unassisted partial breakaway goal at 17:33. Fasko-Rudas hustled his way up the near boards and possessed the open puck, where he went on to roof a shot forehand to beat Weatherill. With 16 seconds left in regulation, McIndoe tied the game, 4-4, with assists from Ty Smith and Luc Smith. He deflected Ty Smith’s left point shot through traffic. Just 53 seconds into overtime, Dewar netted the game winner. He scored on the rush after Spokane hustled back to prevent a two-on-none opportunity, when he buried a wrister from the right wing on Weatherill. NOTES: Silvertips scratches include Ronan Seeley, Conrad Mitchell and Bronson Sharp … the Silvertips entered the weekend ranked #6 in the CHL Top-10 Rankings … The Silvertips have won or gained points in 12 of the past 14 games … Connor Dewar has points in 17 of his last 19 games … the Tips improved to 2-0-1 in the series against the Chiefs – the teams will meet three more times over the next 11 days.